RT is covering the Russian president’s traditional end-of-year Q&A marathon session. Over 1,400 journalists have joined the event, ready to pose a wide variety of questions. It is expected that the focus will be on the US election results, Syrian conflict, and domestic issues. Note: These comments are not direct quotes taken from President Putin. They are updated live and are the closest approximation to the statements made. Any statements may be edited or updated later to reflect more accurately what was said. After almost four hours, Putin calls an end to the marathon session. He closes by wishing everyone all the best for the new year. A return to the issue of Rosneft and Sechin. Why does the money that goes to some Rosneft accounts not go to the government and state funds? Putin says these funds are transparent, and some of them are in fact used. As an example, Putin cites Rosneft money that was granted to science and education projects. These funds will also be used for aviation projects. Putin is asked about the decline in the popularity of reading among youngsters. Will the state support libraries? There is also a question on behalf on an eight-year-old boy about whether robots are needed in the Kremlin. Putin says humans are needed in the Kremlin, and that we can't rely on robots to decide the future of millions of people. As for libraries, these undoubtedly need to be revived - it's important for children. The state needs to support local authorities on how to help the youth of the country develop. What has been Putin's biggest mistake as president? 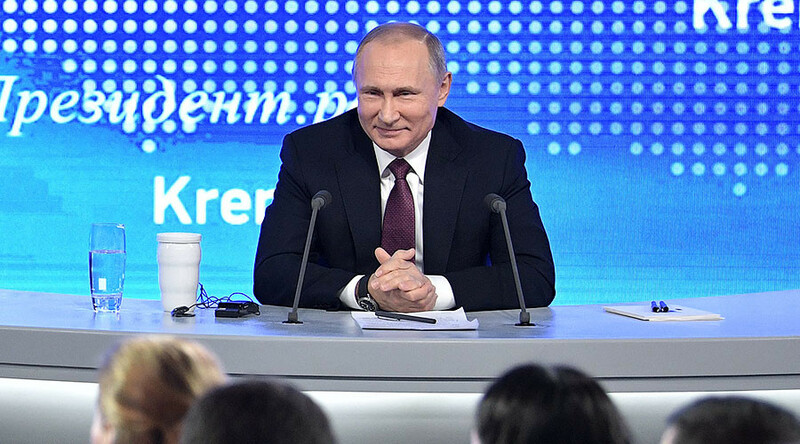 Putin notes that he's been asked that question several times, and says that everyone makes mistakes, and that he does not want to repeat his answer again. He notes, however, that we all have 'homework' to do, and that he will continue to do this. 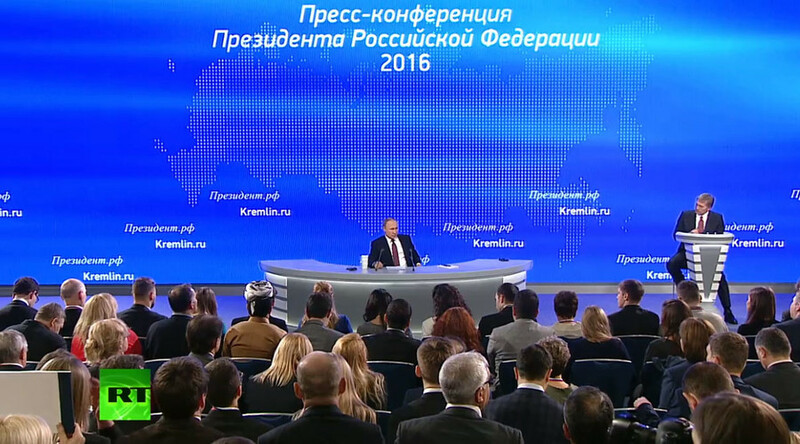 Putin asks for two more questions only, otherwise the event would be ‘endless’. When will Putin meet with Trump? Putin says Trump will need time to organize his administration, but of course they will need to work together to restore relations. Question: Will the president support the idea of VDNKH-type markets across Russia, with locals exhibiting produce again. VDNKH exhibition area has been revived. If locals have ideas about presenting their goods in Moscow, of course the mayor of Moscow would be ready to listen. A question on neighboring Georgia. Cultural and political relations have improved, but recently seem to have stalled, presumably due to territorial issues. 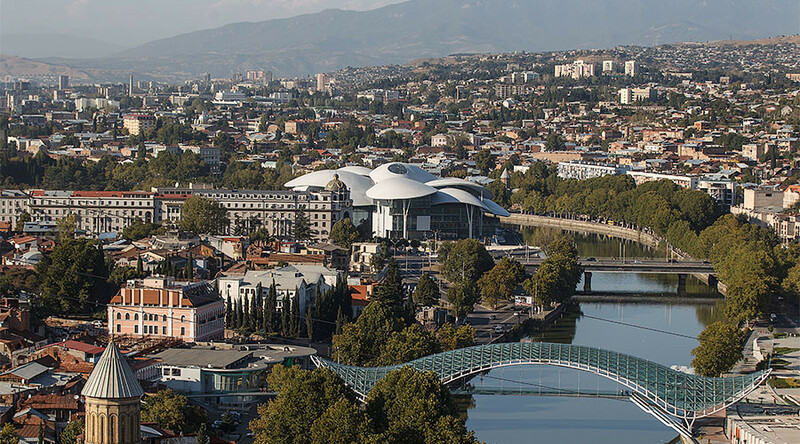 With Georgia being granted visa-free access to the EU - is there a chance of this happening for Georgians with Russia? The president says the regime was only stopped due to the war of 2008, but it was not Russia that began the conflict. We need to start by normalizing relations between security and anti-terrorism forces. Editor's note: Russians have visa-free access to Georgia, but not the other way around. There are no official diplomatic relations between the two countries. The recent tragedy of poisoning in Irkutsk, where dozens of people died after consuming bath lotion. What is the president's view on measures to combat alcoholism? Putin says that words fail him about the extent of the tragedy. The local authorities failed the local population with their lack of controls. A foreign company set up the company that produced the lotion, but the methanol content was not controlled. The level of alcohol addiction is a problem, but no worse than in other countries, especially Nordic countries. We cannot simply ban things, but we need to continue to work on it. Education is important. Putin urged the media to assist in this. Three-and-a-half hours into the marathon Q and A session. The president appears to be indefatigable.